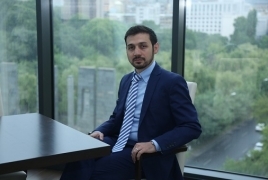 Hovhannes, what are the distinctive differences between banking in Armenia and Russia? The first difference is that we have no state-owned banks in Armenia. All the banks are privately owned. This is why the competition among them is very tense. There are also international players here such as HSBC, VTB, Credit Agricole, etc. Nevertheless, local banks successfully compete with them, and Ameriabank, as a private local bank, has been holding the lead for many years. Secondly, Armenia’s bank regulation is much stricter. It has been instrumental in helping local banks avoid defaults over the past 16 years. After a period of "cleansing" in the late 90s and the first years of the new century, the regulation became even more stringent. Our market is more liberal than the Russian one - for example, we have no currency control. The reluctance of local banks to finance large government infrastructure projects can be viewed both as an advantage or disadvantage. In this sense local banks are less exposed to risks. In terms of technology development, if we look at the leading Russian banks, they are more advanced and we still have a lot to learn. This is probably because of a conservative approach shown both by the country's leadership and, in some cases, the leadership of different banks to all sorts of innovation. Are there any special relation between the banking sectors of Russia and Armenia? We have good partnership relations with colleagues from Russian banks. But despite the fact that the economies of our countries are mutually integrated, I would not say that the Armenian and Russian banking sectors interact strongly with each other, not counting VTB that has a small retail banking presence in the Armenian market. As regards technology, Softline has built a data processing center for Ameriabank this year. What banking services will it be used for in the future? Today, the banking sector is undergoing a fundamental transformation: it is obvious that banks are not going to limit themselves to selling financial services only. For example, the Russian Sberbank is positioning itself as a platform for clients who can use a huge number of services through the so-called one stop window. The task of the bank is to offer the clients the services which they most likely will buy. To do this, banks apply business analysis, artificial intelligence and other related technologies and approaches. The banks have accumulated a huge amount of data. We see and understand the need for fast and complex processing of this data, because we are aware of how things will be unwrapping in the future. Of course, this primarily concerns retail products, online lending, more advanced mobile banking solutions or other distance channels. Now it is important for a bank to be able to work with the existing data, be able to enrich the data by using information from different sources. In turn, this imposes new requirements in terms of working with data, applications used for their processing and the performance of computing and network equipment. Large amounts of data can also be used for marketing decisions, for determining credit limits; by using these technologies, one can improve scoring cards, etc. The infrastructure, which the new data center offers will help to realize all this. When we ordered this project, we asked the consultant to create such a data center that would enable us to have at least three to four years of supplies in terms of equipment, engineering support and network capacity. Now, the loan decisions are automated, aren’t they? Partially. For some products, human participation is absolutely unnecessary. We want more decisions to be taken automatically and extend this practice from individuals to small and medium-sized businesses. The experience of our colleagues - including that of bankers in Russia - shows that advanced scoring algorithms not only eliminate the human factor (as part of automation process, this is obvious), but also reduce the risks for the bank. Can you call information technology an important competitive factor? They are not yet an important competition element in our market. Nonetheless, it is the clients, who, based on their needs and everyday life habits, dictate the terms to us. If earlier the banks had to exert efforts to make the clients use some technologies, now the client is the one demanding innovations, since our customer base is younger and more competent in the technological sense. For them, especially for the younger generation, all these mobile applications, online banking, p2p transfers are an obligatory part of banking services, although some of the local banks, especially small banks are not in a hurry to invest in technology, since these solutions are too complicated, expensive, and do not always pay off. But the future is for the new technologies, and the banks that lag behind will not be able to obtain all the diversity of the latest technologies in one day. We need to constantly work on banking IT and grow with customers to the level that awaits us in the next, say, ten years. The European Bank for Reconstruction and Development (EBRD) owns a share in Ameriabank. Does this have an impact on Ameriabank in one way or another? In addition to the European Bank for Reconstruction and Development, the Asian Development Bank has also obtained a share in our bank since February 2018. These lending institutions are of great importance for local financial markets, such as the Armenian one, since they set high standards that need to be met not only in order to be credited, but also, in the best cases, to have a share in the authorized capital. These are high risk management standards, public financial reporting, corporate and social responsibility. And even if they do not directly teach us, we just have to constantly raise our level and keep these standards based on their requirements. And since our bank plans to conduct an IPO on well-known international markets in the near future, this is precisely the regime of transparency and discipline in which we are accustomed to working together with these organizations. Sometimes they arrange the exchange of information with other partner banks. We often receive guests from Russian, Central Asian and other banks, and our specialists pay reciprocal visits to these financial structures. We are in a constant learning process, and the EBRD and ADB provide this exchange of experience. Does Ameriabank plan to somehow expand its presence to other countries? We have never hidden our ambitions to enter the Russian and Georgian markets. There were real attempts, but, unfortunately or fortunately, they were not crowned with success, and we concentrated our forces in Armenia. And it worked - we have been leading in the corporate sector for many years holding now almost a third of the market here. Now we are actually becoming the leader in the SMEs and retail segments. It should be noted that Armenia’s market opportunities are very limited. On the other hand, our country's economy is less volatile and more predictable in the medium and long terms. However, nothing can be ruled out. After the consolidation in the Armenian banking sector is over, over in our favor, we will be able to redistribute our resources and begin foreign expansion. We will probably return to this issue soon. In Russia, banks often enter other markets, including non-banking ones. Does Ameriabank move in this direction? We are a financial organization, and our competencies and strengths are concentrated in the financial sector. We now have no plans to try something else. Although theoretically, in one form or another, I do not rule out attempts to enter non-banking markets. But, again, we will not use our resources to create something that we know little about. There is a hypothetical synergy of financial and some non-financial organizations, say, telecoms. This is not necessarily a merger; there may be close cooperation. But for the present we are fighting for absolute leadership in the financial sector. What is the share of remote channels now? What is the prevailing trend among customers- visiting a bank branch or RBS? One third of all bank customers actively use our mobile application or internet banking. One part (25%) is very active, another part is active in controlling the status of their accounts, receiving references and so on. But this figure is growing very fast. In terms of using remote channels by legal entities there are still no good specialized solutions in Armenia. For large companies, this issue is not urgent. A large number of small and medium businesses has real needs for RBS, and we our task is to meet them as quick as possible.